March 16, 2017, 1:39 PM · Welcome to "For the Record," Violinist.com's weekly roundup of new releases of recordings by violinists, violists, cellists and other classical musicians. We hope it helps you keep track of your favorite artists, as well as find some new ones to add to your listening! The Takács Quartet. Photo by Keith Saunders. the complete Beethoven String Quartets, recorded between 2002 and 2004, with seven CDs, a Blu-ray Audio disc, and a bonus DVD. During the 2016-2017 season, the Takács Quartet (now with violinists Edwin Dusinberre, Károly Schranz, violist Geraldine Walther and cellist Károly Schranz) has been performing complete, six-concert Beethoven cycles at London's Wigmore Hall, Princeton University, the University of Michigan and the University of California, Berkeley. All members of the quartet are currently Christoffersen Faculty Fellows at the University of Colorado in Boulder. Takács first violinist Edward Dusinberre also has published a book, Beethoven for a Later Age: The Journey of a String Quartet, about the life of a string quartet, which explores the circumstances surrounding the composition of Beethoven’s quartets with a combination of history and memoir. 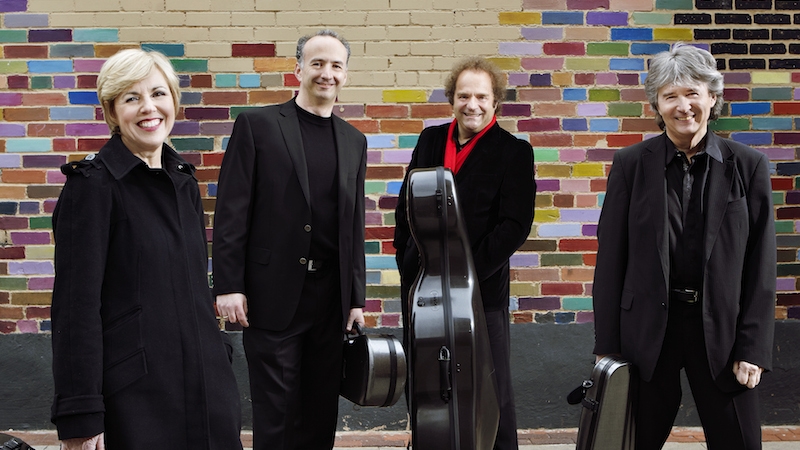 BELOW: From 2009, the Takacs Quartet performs an excerpt from Beethoven String Quartet No. 14, from a live concert at the Auditorium du Louvre. March 17, 2017 at 01:40 AM · I don't see the point of these marathon concert series. How many music lovers can manage the time to see all of them aside from retirees? That's also a lot of intellectual content to take in over a short time; I'm not sure I'd have many brain cells left by the time they got to the Op. 131. March 17, 2017 at 03:46 AM · I saw them a month ago and they played a great Beethoven Grosse Fugue among other things. March 18, 2017 at 03:42 AM · I attend the University of Colorado concerts - The Takacs do not do all six at one or two sittings. The Beethoven quartets are included in their regular subscription concert series along with other pieces. They also have done a variety of other styles and types of music. At their last concert, there were two standard string quartets, and a viola and drum piece called Four Drums and Viola. It was marvelous, unusual, fun, and warmly welcomed by a highly sophisticated audience that is open and not stuffy. They have done octets, quintets that included a 2nd viola, pieces with voice and more. PS. I am not a retiree and have set aside the time to hear them - and all the Beethoven concerti. I know I don't get all the intellectual content (of any music while I am hearing it) ... but I get more each time I listen, and I enjoy each and every one to which I listen.